Announcing the winners of our Much Ado About Nothing contest! Here’s where to find us at Oz Comic Con this weekend! 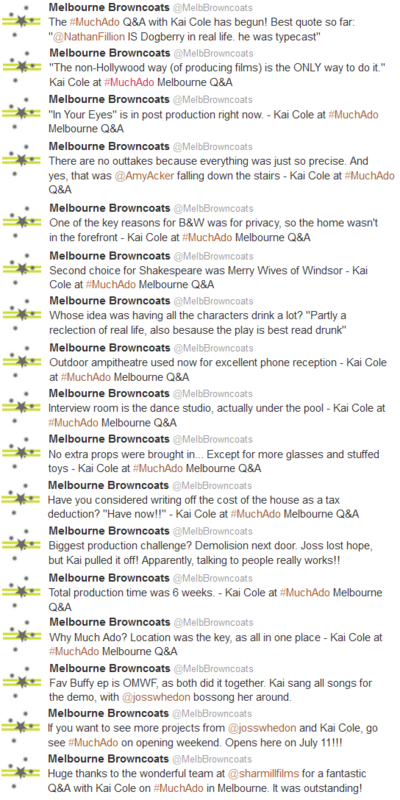 For those unlucky folks who missed out on the opportunity to experience the post-Much Ado About Nothing Q&A session with Kai Cole last night, you missed out on an absolute treat. Kai was delightful – amazingly so given that she was Skyping to Melbourne from her home in California at 4am! Thank you again to Kai Cole and to Sharmill Films for giving Melbournians this rare chance to ask questions from someone so intimately involved in the film. As this was the ONLY Australian Q&A, we are delighted that it was Melbourne’s chance for such a treat!